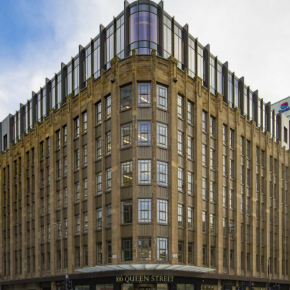 The six-storey office building occupies a prominent corner site across the road from Glasgow’s neo-classical Gallery of Modern Art; it has been refurbished on behalf of property developers Esson. The transformation included removal of an outmoded sixth-floor extension and construction in its place with a new two-storey rooftop addition. The strong period feel of the 1970 elevations has been maintained, while building performance standards have been enhanced. Some 100 Crittall Corporate W20 fixed light windows have been installed in the front elevations, taking the place of the original, single-glazed Crittall profiles. Lucy Addison, Project Director for Comprehensive Design Architects (CDA), commented: “When designing the refurbishment we looked at various options – secondary glazing, replacement double glazed steel framed windows matching existing, or replacement with aluminium windows. “Secondary glazing with existing windows refurbished was rejected on the basis of appearance from inside, and performance. “Replacement with aluminium was rejected on the basis of thicker frames and different proportion of glazing bars, reducing the character of the building. Corporate W20 windows offer strength with slim outlines, are low-maintenance, durable and energy efficient.